Season large amounts of meat with marinades and seasonings easily with the help of a commercial meat injector! 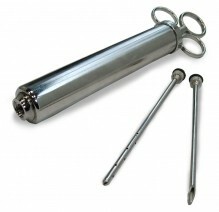 Each pump comes with 2 needles, and is adjustable to use the requested amount with every use. Inject any type of seasoned marinade to achieve the most flavorful homemade meat! Make your flavors unique to your restaurant or food establishment! Looking for a different way to marinate meats and vegetables? Try a commercial vacuum tumbler to marinate your food in minutes! Condiment service pumps and topping bars available for cafeterias, fast food establishments, and hot dog stands! Make your topping bar self-serve, so that your customers can choose their condiments!